If you have a kid, chances are good he or she has read one (or all) of the Diary Of A Wimpy Kid books. The series already has 115 million books in print and looks to increase that even more with the November 5th release of the eighth book in the series, Hard Luck. We spoke with author Jeff Kinney about the new book, his favorite character, his favorite authors when he was a kid, Poptropica, and whether or not his own kids are fans of his book. 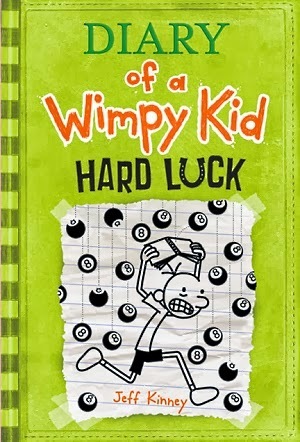 Hard Luck, the latest in the Diary Of A Wimpy Kid series, will be released on November 5th. What does Hard Luck have in store for Greg Heffley and his friends? It only has something in store for Greg Heffley because he has no more friends. Greg is, for the first time, on his own. He and Rowley have sort of gone in separate directions because Rowley has a girlfriend. So Greg is left scrambling, trying to figure out where he falls on the social ladder now that he is solo. Greg decides to start leaving his decisions up to fate because he decides that the choices he's made on his own haven't gotten him very far, so he's going to give himself over to fate. There are an astonishing 115 million books in print from the series. When did you first realize that this was going to be so big? I don't think I really realized that it was going to be so big. In fact, just recently that number jumped up a lot when we counted up our foreign sales and things like that. That was a big shock to me. I thought that if I ever got to 100 million... I thought it was an unachievable number, actually. I'm still not sure what to make of it. What made you decide to focus on the middle school years for Greg and his friends? I think the middle school years are just ripe for comedy because they are the years in which kids can be physically so different from one other. I thought that would be a great setting and usually authors try to avoid it because it's such an awkward time period. Most people don't want to hear about middle school kids. I think I relate to Greg the most. He's the most like me, but I think that Rowley is my favorite character because he likes being a kid. Will we see any further films based on books from the series? I think that now we're going to move to animated holiday specials. As far as the live action films go, we're moving away from that because the kids have aged out of their roles. Are your own sons fans of your work? I think they are. My oldest son has enjoyed the books, but he moved past them pretty quickly. He moved into more challenging reading. His favorite books are the Percy Jackson books. My younger son is in third grade and he's just now getting into my books and it's very exciting to see that he's enjoying them. Do they ever try to give you ideas to put in your books? Not often. We really don't talk about my books very much in the house. That might seem weird, but we keep those worlds separate. We try not to overwhelm the kids with the Wimpy Kid stuff. They treat my books like any kids would, as a new book in the house that they read through. I don't think they really interpret it any differently than that. You're also the creator of the hugely successful Poptropica. What led you to create that? I was mowing my lawn one day and thought, "Wouldn't it be neat to create a virtual place for kids to play?" So I came up with the idea and I pitched it to my company, Pearson, and they liked it so we built it. That's still my full-time job. What authors connected with you as a child? I really liked Judy Blume. I liked those coming-of-age stories. They were probably written more for girls than they were for boys, but I really liked those. When I got a little bit older, I liked fantasy. I liked Pierce Anthony and J.R.R. Tolkien. Those are some of my favorites. Finally, you get a lot of kids interested in reading through your books. What advice do you have to any of them wishing to follow in your footsteps? I would say that if they have an idea, to take your time with it and nurture it. Make it grow into something good because you'll be tempted to put your first idea out there, but you'll have a better product if you take your time to develop something.